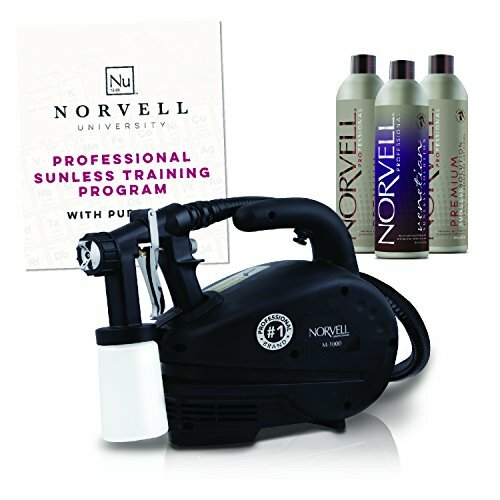 Norvell Sunless Kit - M1000 Mobile HVLP Spray Tan Airbrush Machine + 8 oz Tanning Solutions in Clear Plus, Venetian and Dark + Norvell Training Program (Retail Value $490) by Norvell at ETCF Blog. MPN: M1000 Kit. Hurry! Limited time offer. Offer valid only while supplies last. BUNDLE INCLUDES: Norvell M-1000 HVLP Mobile Spray System; Norvell Tanning Handheld Solutions - Clear Plus 8oz, Venetian 8oz and Dark 8oz; Norvell Training Program. PROFESSIONAL #1 BRAND: Norvell Sunless Rated #1 Professional Sunless Tanning Brand by Professional Spray Tan Artists/Technicians October 2017 (Research conducted by Fieldwork/Webwork International Inc., a global leading market research company). M-1000 HVLP MOBILE SPRAY SYSTEM: Expertly crafted from top to bottom for the optimal application of Norvell Premium Solutions, this lightweight system produces the ideal spray for a smooth application. Purchase Includes - Mobile M1000 Turbine, 10' Quick Connect/Disconnect Hose, M Series HVLP Spray Gun, Standard 110v Electrical Cord, Spray Gun Quick Repair Kit, Operation Manual, Shoulder Strap for Added Portability. Use with Norvell Pop-Up Tent. TANNING HANDHELD SOLUTIONS: Norvell Tanning Solutions are formulated with micro-nutrient technology to deliver a potent blend of vitamins and antioxidants to boost the skin's Just Off The Beach bronze tan without the orange undertone. Spray tan solutions are fragrance-free and enhanced with natural essences. Formulated without Parabens, Gluten, Sulfates, Phthalates, Synthetic Fragrance, Petrochemicals, GMO's, Tricolsan. PROFESSIONAL SUNLESS TRAINING PROGRAM: Learn the fundamentals and science of Sunless Tanning, Sunless Colorology from the experts. If you have any questions about this product by Norvell, contact us by completing and submitting the form below. If you are looking for a specif part number, please include it with your message.